To say that this trade had its ups and downs would be a huge understatement. It was on heck of a rollercoaster ride! Since I sold this pair a week ago, price has spent just about as much time above my entry as it did below it. It started out pretty well, as the ECB statement weakened the euro the day I shorted EUR/JPY. But the following day, EUR/JPY recovered and traded above my entry. Just when I was started to worry, the market turned and tanked again. Dovish words from an ECB official and news that Italy’s credit rating had been downgraded forced the pair to retreat. At this point, I was starting to feel confident about my trade, especially since it continued trading lower. I was up over 100 pips at one point, so I decided to move my stop to breakeven and take some risk off the table. Unfortunately, the market had another surprise up its sleeves. After the FOMC meeting minutes came out, the euro staged a strong rally and lifted EUR/JPY back up above my adjusted stop loss. Stopped out at 129.68: +0 pips, +0.00%. It’s a pity that the trade didn’t bag me any pips after I held it for such a long time. But that’s just the way it goes in the forex market. Sometimes you win, sometimes you lose, and sometimes you walk away at break even. On a more positive note, I was finally able to bag a winner with my GBP/CHF trade. Tune in tomorrow for the full update on that trade! First up, I wanna say Happy Fourth of July to all you U.S. traders! The last quarter was pretty crazy (I would know!) and some of y’all might wanna take this day to relax, start a BBQ, and rest. However, I decided to not take the day off, as I really wanna get myself out of my recent slump. Luckily, I’ve spotted this intriguing setup on EUR/JPY that I think is worth the risk. 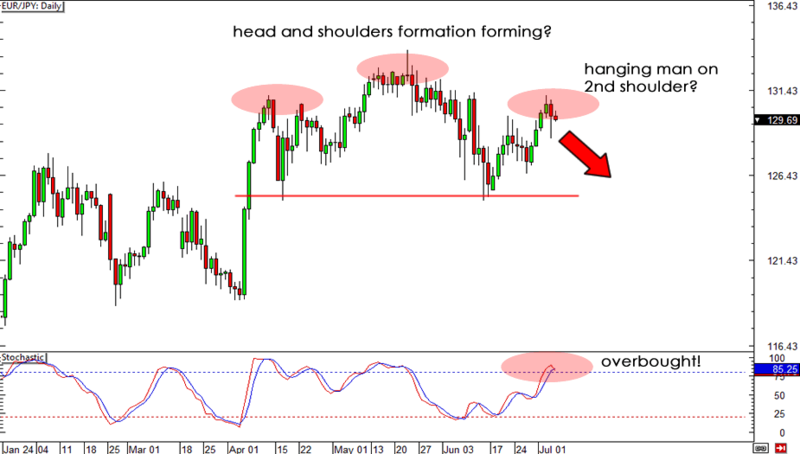 The pair appears to be forming a head and shoulders formation, with price now stalling and forming the second shoulder. Furthermore, Stochastic is deep in overbought territory and a hanging-man candlestick has even formed. This is normally a pretty bearish candlestick, so I think we could see sellers jump back in and send this pair lower. Fundamentally, the euro could be in for some trouble over the next week or so, as Portugal is now back in the spotlight. Some government officials who were part of the minority CDS-PP political party decided they were unhappy with the direction that Portugal was headed in, and sent in their resignation letters in an attempt to show a lack of support for the current regime. This sent Portuguese bond yields shooting higher and sparking some risk aversion in the markets, weakening the euro. I’m thinking that this may weigh on investors’ minds for the meantime, and that we could see the euro bears takeover for a bit. Short EUR/JPY at market (129.68), stop loss at 131.40, take profit at 125.50. I put my stop just past Tuesday’s high, as I think a move back up to that level would invalidate the hanging-man candlestick signal. As for my take profit point, I’m aiming for the neckline around 125.50, but I won’t hesitate to make some adjustments along the way if necessary. My only concern for now is the upcoming ECB interest rate statement. I think my stop of just over 170 pips should provide my trade enough leeway for any extra volatility from the ECB statement. Besides, I have a slightly bearish bias, since ECB Governor Draghi has been talking more and more about negative deposit rates recently. If he takes a dovish tone at today’s statement, it could send the euro into another selling frenzy. Anyone out there brave enough to join me on this setup? Will EUR/JPY continue trading lower?